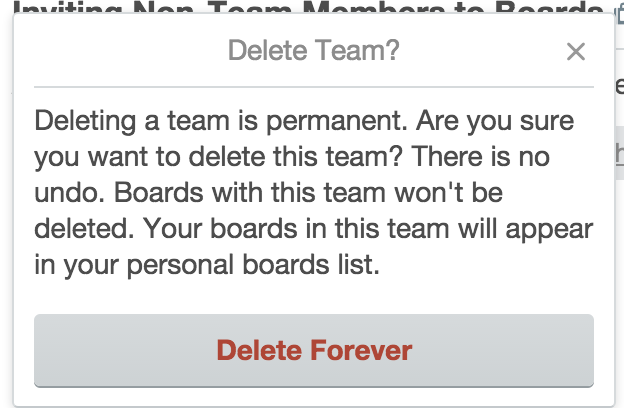 You can delete a team by going to your team's page in Trello, clicking on the "Settings" tab and then clicking the "Delete this team" link. You must be an admin to delete the team. Deleting a team is permanent and there is no undo. Boards within the team won't be deleted. Instead, your boards in this team will appear in your personal boards list. If a team with an active Business Class subscription is deleted, the Business Class subscription will be cancelled, and you will no longer have access to Business Class features (unless you're a member of another Business Class team. There will not be an automatic refund for the deleted team, although users may request a refund from the support team. Only team admins can delete a team from the team's settings tab.